Nothing much going on here today. I have the first round of exercises in, 2pm another round. 19 degrees this morning and some clouds around. WW, might be a better day today on the ice. The ice can "go" a lot faster than it forms. Thanks for sharing your fishing trip. Good Luck today. IW, My wife has found out about how long it takes to get back in the swing of things after so much time in the hospital. The old body just doesn't re-bound like it did a few years ago. Seems like you have a good handle on when to step back some when it starts to bother you. Eddie, you and the wife enjoy the concert tonight. My wife saw an ad on TV for it and said she would like to go but she shouldn't do big crowds and I don't do crowds of more than 5 people at a time and some of those are 2 or 3 too big....lol Good luck if you get out on the ice. Good Afternoon Everyone, Beautiful day out today. Currently 48 degrees. Most of the snow is gone. I have surgery on my neck in 20 days. Hoping that will help my headache as well as my arm. Seeing the neurologist for a check up in 6 weeks. Another round of injections in 12 weeks . They did say sometimes it takes multiple rounds. We think the reason my headaches got so bad is one of the meds i’m On the pharmacy messed up the count and I ran out. Since it’s becoming a controlled substance they wouldn’t let us fill it early. They filled it after they realized they were in the wrong. WallyWorld, Looks like a beautiful day on the lake. Thank you for sharing. MasonEddie, Hope you and your wife have a good time at the concert. IceWanderer, Hope you get your sling off today and pt goes well. Deerefishyfishy, Hope you had a safe trip home. IFF, Hopefully that is the answer to the fix. TomTurkey, Hope your wife is feeling better after the surgery. Hunts2long, I’m glad your wife is feeling better. Made it back home a little after 4pm. Glad to be back and the kiddos were happy too! It's 32* and partly cloudy, with rain and snow in the forecast. Capt. Jim.......My sympathies to your Ellie for the break to her upper arm, that's a rough place, she will be very incapacitated for a while. I hope it's not her dominate arm! I-45..............I hope the surgery helps. Marv.............Sound s like you're keeping up with your exercises on a schedule, do you set an alarm clock to remind yourself. I hope everyone has a good Thursday either at work or out on the ice. CaptainJim, Prayers for you and your wife . Ice Wanderer, That’s good your therapy is working. Capt Jim sorry to read about the better half's fall and shoulder injury. Steps and Women! My better half is back at work. Comes home with a sore foot everyday so far. Best of luck. 33 heading into the 50's today. I am sitting in the eye Dr's office, time to get my eyes checked. WW sorry to read the fishing season is over for you, hope the boat doesn't need much to get ready. IW glad the sling is over. I don't set a clock, I have always had a good internal clock. Eddie glad you had fun at the concert. Time to go. Hope you all have an excellent day! Good evening rainy day here may see more Friday into Saturday. IFF may the new cable solve problem with the I pilot. Wallyworld congratulations on two good end of season ice fishing trips. Besides getting the boat ready also time to get out the motorcycle. Eddie how did you and the wife enjoy the concert always wanted to see Fleetwood Mac. I was checking the website for Bethel Woods Performing Arts Center the other day wanted to see if they were hosting any big festival for the 50TH anniversary of Woodstock festival. Carlos Santana is performing one day ticket prices out of my budget range. Also see Jackson Browne,Peter Frampton and Heart will be performing there this Summer. Bethel Woods is located on the site of the 1969 Woodstock Festival. Ice Wanderer congratulations on being able to loose the sling. Safe travels this weekend to Florida. Whopper Stopper how did things go with the eye doctor. Hunts2long easy for most of us to forget about all the things in life someone with a compromised immune system has to give up to stay healthy. Deerefishyfishy glad you are back at home. UFCreel best to your wife as she recovers from the broken foot. Capt. Jim sorry to read about wife's fall best to her with any surgery needed and recovery. A safe night to all. TGIF! Fairly calm and raining, 35* at the moment, that will be changing soon....heavy wet snow and strong winds on the way, high of 38 for today. Guessers are all over the place on accumulation, but 3-5’’ 5-8’’ for my area is expected due to elevation. We’re right at the 1500’ elevation range they say this storm will have its biggest impact on...we’ll see. Steve... Long gone are the good old days of $5 lawn seats to see top name performers play and the bands not being restricted to finish their performance at a precise minute. The ticket prices nowadays make one gasp, that’s for sure! Marv...hope all went well for you yesterday at the eye Dr.’s! Wally...congratulation s to you and Mr.WW on your finale, beautiful day to end the season! Will be anxiously awaiting the open water trips you have coming up....best of luck with the boating season! I-45...hope those headaches are gone and you’re feeling better Sir! Jeff...excellent news on the progress with your arm! Wishing you safe travels tomorrow and the strength to get through this most difficult time. My Sincere Condolences go out to you and the family. Capt.Jim...so sorry to read about your wife’s injury, wow! Best wishes sent to her for a quick recovery. H2...I’m not big on crowds on either, but I do love the atmosphere created for a concert or a big game. The downfall is dealing with the traffic on the way out, lol, it took us almost an hour just to get out of the parking garage. The concert was absolutely fabulous, beyond my expectations actually considering they played without one of their key players, Lindsey Buckingham. He was replaced by two other fantastic guitarists and they were outstanding as were there vocals. There was a wonderful, pleasing feeling to the crowd that’s hard to describe before the band came out on stage. I think it had something to do with the age bracket...from great grandparents to great grandchildren maybe? Whatever it was , it was very special. We’ve seen Fleetwood Mac several times over the years, but I must say, this was probably the best performance I’ve ever seen them play. Maybe I just appreciated it more kind of knowing it was probably the last time we might see them perform, but the nearly sold out crowd in the arena reinforced that. They were simply amazing from start to finish. They played without a warm up band and were on stage slightly over 2 hours. Ended with 3 encore songs. Beer prices were simply amazing as well...a 24oz. can of Lite was $12. I took the day off and recouped, we didn’t get home until after midnight. Did hit the lake mid morning for a few hours....ice was still in decent shape but the shoreline was starting to go. Today’s weather will put a hurting on that. Fishing was super slow again....couldn’t find many fish, but it was still a good time out. Well, time to get ready for the last shift....Cawfee’s on! 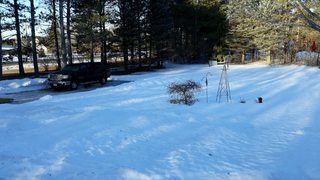 It's 34* and snowing, it started yesterday around 5 pm, snowed a while just enough to cover the driveway, then it stopped. We could get up to 12"
Eddie........I'm glad to read that the concert was good, I'm sure your wife appreciated it. I hate the crowds as well. Marv.........Hopefully you didn't have any problems at the eye Dr..
be going, he'll be plowing for 20 hrs. to say hi. he was bailing perch and not a lot of dinks like usual. It was nice talking with him and another friend. I hope everyone has a good Friday either at work or fishing or putting gear away. 35 and wet snow falling. Looks like about an inch so far. I had to take the Jeep in yesterday at 8am for the repair on the front bumper. They had told me it would take just over an hour. It took 4 hours to replace 3 pieces of plastic on the lower bumper. They only billed me for the 1 hour they had quoted me. I told him he didn't make any money off me yesterday and he told me he will make it up next time I come in. They are very good to deal with. They had never had a 2019 (re-engineered) Jeep apart. He even took pictures. Came home and watched some basketball. Capt. Jim, sorry to hear about the wife's fall. Hope she is doing better. WW. glad the last day on the ice was good. I always enjoyed the late season on the ice. Over the years we caught some very nice perch out of Lakeville on Conesus Lake. Eddie, sounds like everyone had a good time at the concert. When I had the office in 80 State St., I parked in S. Perry Street ramp. It could be a real pain at times. Did it for almost 14 years. I guess I should catch up. It has been a few laid back days. The high 50's guessed for the week end has gone to the mid 40's. The wife has been doing pretty good. She slipped a finger down the top of the bandage and felt stitches. She thought that they had cut he up the bottom off her arm. I looked at my arm from the same surgery and realized it was where they got the cartilage to put in place of the bone they took out. Just a small incision. Her pain has started to diminish. Eddie I am glad that you and your wife enjoyed the concert. I have not been to a concert in years. I too do not like crowds any more. The cost of tickets has gotten to much for me to even consider going to one. We used to have an outdoor venue west of my other place. Some real big names came their including Willie Nelson, he came back again saying he loved playing there. The hard rock bands were the only ones that caused any trouble. The venue closed. A guy built a huge log cabin house right across the road. When they reopened for a while he tried to get the place shut down. Every time he tried the locals told him "You built their knowing its history so too bad." H2l sounds like you have a good body shop that sticks to his estimate. My wife's friend that has a car repair shop hired a guy to manage his shop. Every time we took a car their to be fixed the bill was always way higher than the estimate. Her friend finally fired the guy because he was ruining his business. Her friend even offered to refund customers the money they were over charged. IW Not being used for a while leads to stiff and weak muscles. I was confined to bed for over a week when I had non paralytic polio. When they told me I was going home I bailed out of bed. The next thing I knew was the nurse was helping me up off the floor. People are still calling the wife with questions about the assn. since they can not get board members to respond to questions. If they cancel the meeting next month they better put a notice out some where other than face book. The one board member tried to say how many perch there are in the lake when they had their fishing contest. To bad the few guys that I talked to were not at the meeting that can not catch enough fish to have a fish dinner. Eddie, now this is a first. The news last night said that both the Metro lakes (both Cherry Creek & Chatfield) would have the Rangers using "Ice Breakers" to clear the remaining ice sheets, so the lakes could be opened sooner. Guess they don't want to miss the spawn of the walleyes, and collect as many breeders as they can. Won't get that cable part until the 28th, but think I will be launching without it and just go with the foot control. Think I will leave for work early so I can do a drive by the lake. 42 knocking on 50 this afternoon. Word is tomorrow may have a couple of 60's on a few bank thermometers. WW Hope the snow skirts around you. Our snow is dwindling but still present. I have totally had enough. Yesterday's eye appointment went excellent for me, 20-15 with glasses. I get a new pair of lenses from warranty and will keep my frames. Today my wife had to have hers checked. For the last year she has been fighting an iritis. It has been an on going battle which has required 5 different drops twice a day. They thought they had it under control just to find out that the pressure in her one eye was dangerously high. She needs to try a couple more drops just to rule them out then if nothing changes she will need to have surgery on the eye lens and possibly have ducts put in. She in most cases is a rock handling set backs of sorts, but this has really got her upset. I went down to her work and tried to calm her down but I didn't get to far. With her condition the chance of vision loss or blindness is very real. She will see a specialist next week. Hope you are all having an excellent day Stay safe. woops spoke to soon, cable was waiting for me when I got home. Drive by at the lake looked like it was completely ice free. Glad I have two days off now. Looks and sounds like winter has returned here this am, lol. Snow is letting up some, 24* with 35mph winds howling through the trees outside, high of 35 today. Difficult to tell how much snow we’ve gotten at the moment, there was about 3’’ yesterday afternoon when I got home....guessing 6’’ maybe? Jeff...hoping this foul weather doesn’t delay or cancel out your flight today, best wishes and safe travels Sir. Glad you had a chance to get out on the ice with John for a little while, awesome! Bud... hope the new cable solves your problems! Best of luck with the first trip out on the open water. Capt.Jim...going to be a bumpy ride for a little while, hang in there. Hope Tuesdays appointment goes better than expected...best wishes to Ellie from NY. Marv...so sorry to read about Jo’s eye conditions. Will be keeping her in my thoughts and prayers, hopefully the drops will relieve the pressure. Please keep us posted. Ended up with mostly rain here along with a dusting of snow. Temps going back above freezing starting tomorrow. I am so ready for spring !!! Have a good day whatever's on the agenda. Stay safe. Happy Thanksgiving. Wife was in the ER waiting for a ride down to NYC this past Thanksgiving so we are having it today, just no deer hunting in the morning. Capt. Jim, thoughts are with you and your wife. Looking at mid 50's later this afternoon, that should help with the snow melt. Thanks for the best wishes for my wife. She was a lot better last night after a couple of calls back and forth with the specialist. She was told to hold off until Monday to get the drops. The drops that they want her to take are some she tried last year. Her eye flared up from them and it took two weeks before she could clearly see. The specialist said she has to take them again to rule them out Now besides that the drops are $400 and currently the insurance company won't pay for them. So the new Dr wants her to hold off so he can contact the provider and see if he can get them to pay. He said if they work like last time she may only need 4 drops to find out, so he hates to see her have to pay full price. I have a feeling we will be learning a lot about insurance companies in the coming weeks. We are going to take a ride to the shack this morning to check it out, first time this year. Good day, only received rain from the latest storm currently sunny but windy. Ice Wanderer do not know when you will see this but may the weather not cause you any travel problems . Sorry Logan will not be able to make the trip. Safe travels will be thinking of you and your family this weekend. Eddie hope the drive to today's side job was not to bad never fun towing something behind your vehicle on slippery roads. It is sad Mr.Buckingham and other members of Fleetwood Mac can not resolve their problem/problems. Glad his replacements gave a good performance. I have to look into and listen to Lindsey Buckingham's solo work since by marriage he is related to my BIL. One of my BIL's cousins is married to Mr.Buckingham's niece. Wallyworld good to hear you have recently started up your motorcycle. Someone who belonged to a large local motorcycle club must have died recently large funeral procession passed by my appartment complex earlier today over a hundred bikes. Have a safe southern trip . Hunts2long nice you have a mechanic /repair shop that will stick to it's estimates. Enjoy today's Thanksgiving celebration. Tom Turkey happy to read your wife's hand is healing nicely. Just a thought about the Assoc. Board problem has anyone looked to see if local or state law requires them to have and produce on demand meeting minutes and other paperwork. The town or state may due an investigation and take action if laws are being ignored by the board. IFF always nice to get an expected package early may the new cable solve the I-Pilot problem. I think you maybe correct about the state breaking up the ice so they can collect walleyes for the breeding/stocking program. Whopper Stopper may all work out for your wife with her eye issues. Hopefully your insurance will cover some of the cost for the drops. Capt.Jim best to you and your wife getting through this difficult time. May the Ortho. doctor have a course of action for your shortly after the appointment. Have a good and safe Saturday. Best to all fishing. Good Evening Everyone, Started out snowing this morning but the snow is all gone. Neck and headache and numbness in my right arm were bad today. Surgery in a couple of weeks. Capt Jim, I hope your wife is feeling better. IFF, How is your leg doing? Hope the cable fixes the problem and you get the boat out soon. Mason Eddie, How did your first side job go? Hunts2long, Hope you had a good Thanksgiving with your wife and dinner was good. Tom Turkey, Glad your wife’s hand is getting better. I hope everyone had a good Saturday and that everyone has a good Sunday. Don't think I will rush getting the boat out. Want to go over everything, wheel bearings included. Have to put the 2019 sticker on the license plate is another thing to get out of the way. The infection or what ever it is, still hanging on. Might just have to consider it part of the old age process. Not expecting any moisture until mid week, but if like in past years, April brings showers, and winds not to my liking. Clear and calm 28* this am, high of 51 today. Winds were so bad yesterday we had no choice but to cancel out the job and just get it totally ready for today. Bud...smart thinking on the boat, especially the wheel bearings! Sorry about the Kansas loss, I had them going deep in my bracket as well. I-45... hope today is a better day for you Sir! Steve...the driving started out very slick yesterday morning, but as soon as I got off the mountain it was like another world. Hardly any snow to speak of. The weather guessers were spot on about the higher elevations taking the hit. No problems with the towing. Marv...glad to read Jo was feeling better yesterday, hope you had a nice trip to the shack and found everything to be ok! H2...Happy Thanksgiving to your wife!! Hope the turkey and fixings brought her happiness yesterday, awesome choice! Wally...another trip south coming up, now I’m jealous....lol. Where will you and Mr.WW be heading this time? Jeff... hope your travels went well....thinking of you today. 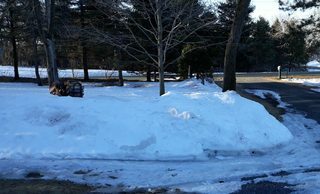 With my driveway facing West, had snow drifts knee high yesterday in spots from the relentless winds in the30-40mph range. Crossing fingers that was the last time the snowblower gets pulled out. Had high hopes for a last trip to Lake George today, but as my quote in the avatar says, lay bricks or go fishing, Doh! Today it will be laying bricks...but tomorrow it will be $$ for a deal on a new shelter for next season. Time to get ready for some mud slinging with the boys, working with some real good guys today....I’m quite certain there should be some type of story to be shared here later. Well, it's been a little while since I posted. The ice is gone, and it's time to be ready for the open water season. Matter of fact, we got the ol Grumman sport canoe ready (we hope) yesterday and plan on getting on the water today. We'll be looking for them hog perch and slab crappie. High of 53 with periods of clouds and sunshine today. 23* this morning, and everyone thinks I'm crazy for wanting to go fishing! Oh well, I guess they just don't get it. Eddie, good luck and be safe on the job today! I-45, I hope you feel better today. And, if I'm not back here before, I hope your operation goes well! Good luck to those on the ice or in a boat today - stay safe and tight lines!